Sports and math are a natural connection. You can’t have a game without numbers. Statistics are the result of every contest. Sports are an easy way to turn abstract math into something measurable and tangible. In fall and winter, sports minds are on football. It will be easy to get the class talking about the weekend’s games. Don’t think it will only be the dudes, either. The girls may be just as happy to talk about their favorite teams and players. 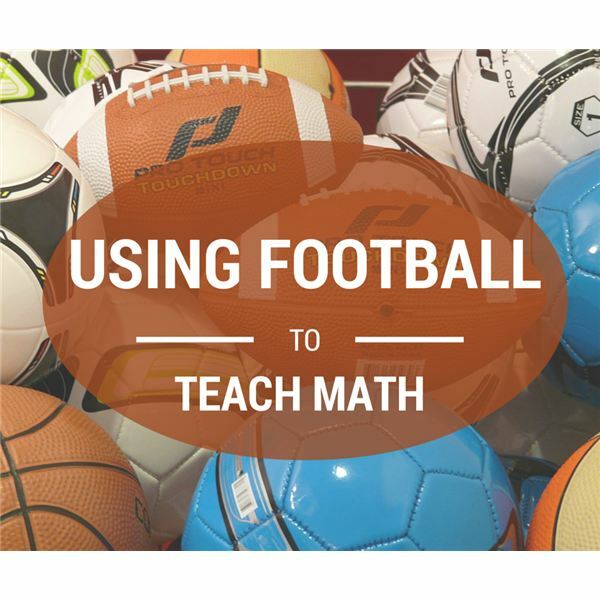 If you are doing it right, a football-based math lesson should be more engaging than plain numbers on the board, even for those who don’t love the game. You can build lessons for students of all levels using the numbers of football. Start out simple then go as complex as your students can handle. For kindergarten and early elementary students just getting started in math study, begin with basic addition. Introduce the scoring of football (touchdown = 7, field goal = 3, etc.) and have them practice adding up scores until they have it nailed. If my team scores two field goals and one touchdown, how many points do we have? Then you can add some twists. If my team scores two touchdowns and three field goals while the other team scores three touchdowns, who has the most points? If the team’s three running backs rush for 95, 86 and 23 yards, how many rushing yards does the team have? Give your students a final score for a game, such as 42-27, and have them compute the various ways each team could score to end up with that total. Work with the 100-yard field so your students can practice breaking up the number 100. This will come in handy when they start working in percentages. If my team has the ball on our 24-yard line, how many yards do we need to gain to get a touchdown? For elementary through middle school, you can make things more complex. Throughout sports, percentages are used to describe how often an event occurs. Start with easy problems your students can do on paper or in their head. If my quarterback completes 7 out of 10 passes, what is his completion percentage? If my team wins 8 of the 16 games this year, what is our winning percentage? Have your class dig into the news or box scores to find their own statistics. Using a play-by-play recap, have your students tally how often a team ran the ball as opposed to passing it. Then they can turn this into a percentage to determine which teams prefer running and which prefer passing. They can further break down the statistics to determine tendencies and make predictions. They will use this skill their whole lives. Is the team more likely to run or pass on first down? How does that percentage change on second or third down? How often does the quarterback throw to the same receiver? Does he show a preference or distribute the ball evenly? Bring the addition and percentage skills together to compute averages. Give your class the rosters from various teams. Have them deliver the average weight, height or age of players of different positions. Then compare notes. Which team is the youngest, heaviest or tallest? Which team’s offensive linemen have the highest average weight? Which team’s wide receivers have the highest average height? Then they can compare those numbers to other statistics. Does a heavy offensive line equate to more rushing yards? Does a team that averages 6 years of experience per player have fewer penalties than a team that averages 3 years of experience? Your students can get into the career statistics of veteran players and compute averages for yearly or weekly performance. Did the player often exceed or fall below his average yards per game? Was the player very consistent? Send your class hunting for statistics on anything and have them determine averages. Comparing these numbers from year to year and player to player can be revealing. How long is the average career of a player taken in the first round of the draft? How does this compare to players taken in later rounds? How does the average tenure of a team’s head coach compare to the franchise’s winning percentage? Does keeping a coach for a long time equate to more wins? Sports are a great way to create word problems and complex equations for students all the way up to high school and beyond. You can begin with a simple chain of addition and subtraction. My team starts on our 20-yard line. We gain 10 yards, then lose 3, then gain 12, then have a penalty for 5 yards and then gain 4. What yard line are we on now? You can tie in what they have already learned about percentages and averages. If a quarterback completed 80% of the 35 passes he threw, how many did he complete? My team averaged 18.2 points per game over a 5 game span. In the first four games, we scored 21, 14, 30, and 17. How many points did we score in the fifth game? The sky is the limit with the complexity of your equations. You can have your students build their own and attempt to stump each other. Use equations to tell a story and solve a real problem. For a real challenge, have them compute one of football’s most confusing statistics: quarterback rating. For some reason, a perfect score is 158.3. For your most advanced students, their greatest challenge will be to predict the future. In any business, those who can accurately divine what is likely to happen are tremendously valuable. In football, it is no different. Have your students dig into history to determine the historical success rate of certain football events. How often are teams successful on two-point conversions, fake punts or fourth and inches? What is the probability of a quarterback taken in the first round winning the Super Bowl or being selected to multiple Pro Bowl teams? How does this compare to other positions? Students can apply this skill to a wide range of what/if football situations. It’s fourth and five at the 50-yard line. Should I go for it or punt? What are my chances of getting a first down? What are my chances of punting the ball inside the 10-yard line? What is my opponent’s chance to score if he gets the ball at the 50? At the 10? Coaches and players are often faced with tough situations in the game. In the middle of battle is no time to compute probabilities. It’s best to think about it ahead of time and be prepared. When to go for a two-point conversion is one of the biggest decisions. Perhaps a football lesson would fall totally flat in your class. You know them best. Incorporate whatever interests them into math lessons and they will stay more engaged. Build the course around music or flowers or cars if it gets them thinking. Of course, sports interests are seasonal. When spring rolls around, minds are more in tune to baseball. Every four years, you get a chance to focus on the Olympics. When snow hits the ground, it can be time to do a skiing lesson. Whatever the medium, attach the numbers to something real and interesting. Your students will benefit.